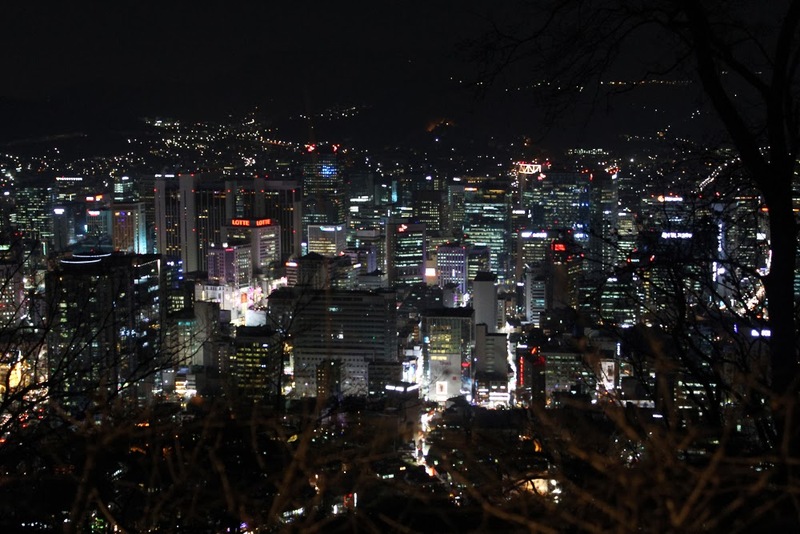 South Korea 2014 Adventures Part 4: So Long, Seoul! Before heading stateside, I spent a few more days in Seoul to sightsee and shop. I found a hostel right by Myeongdong which was pretty perfect in terms of convenient shopping. 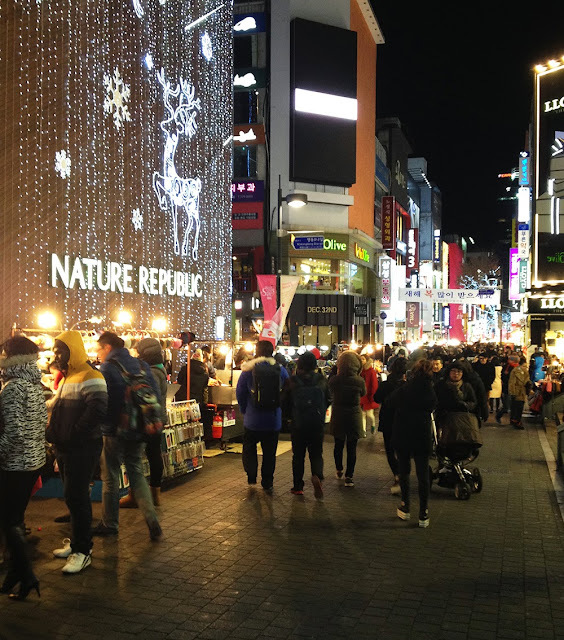 At night Myeongdong transforms into one of the most densely packed areas of Seoul. 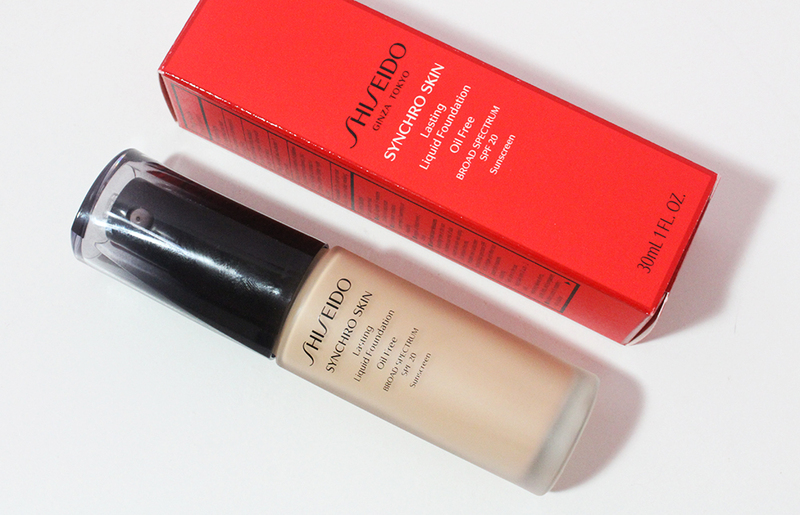 Every major beauty brand and clothing company has a location in Myeongdong which makes it very convenient if you're only in Seoul for a day or two but the atmosphere was a bit stressful and I found the sales associates here to be quite rude. A lot of the restaurants in Myeongdong are located on the second floor so it can be hard to judge if a place is good. 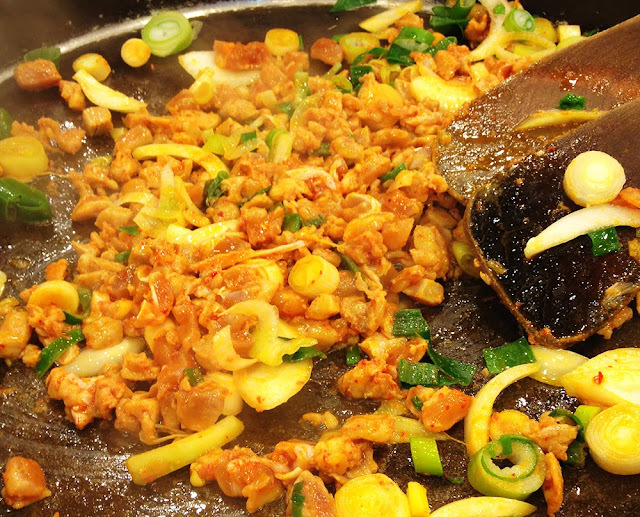 My friends and I found a very busy kimchi fried rice joint which was conveniently located at ground level. They cook the fried rice on a hot pan in front of you and it was delish and very filling. 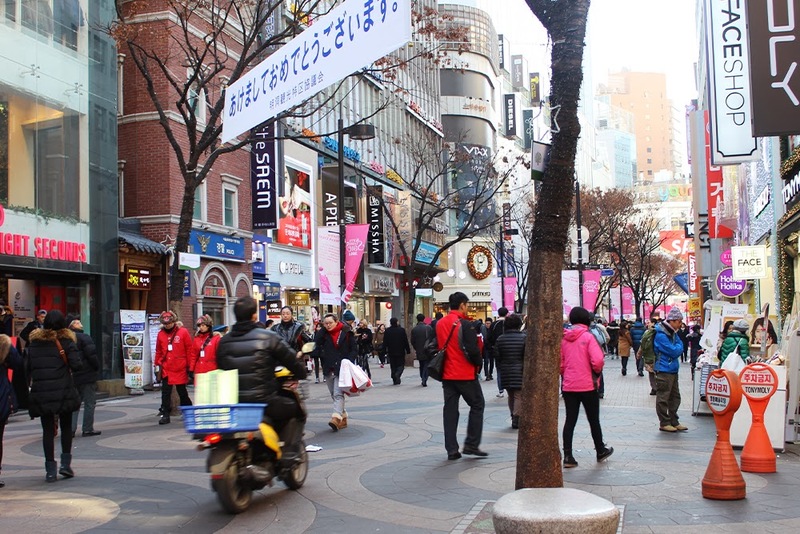 Here's a better look at a street in Myeongdong during the daytime. You can see a bunch of beauty stores such as The Face Shop, Missha, The Saem, A'Pieu and Holika Holika. Every block has pretty much the same stores. 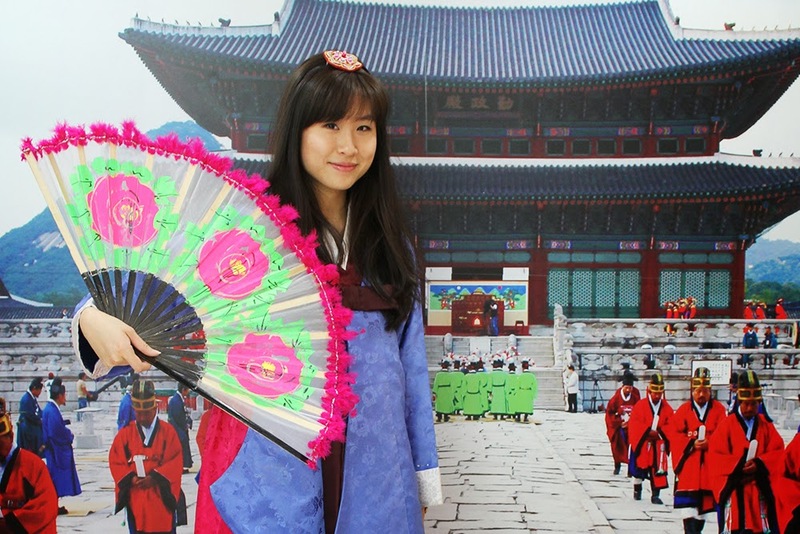 The tourist information center is also located in Myeongdong and you can try on "hanbok" (Korean traditional clothes) for free and take some pictures. It was a fun little activity that was in the area and definitely worth a try. The hostel I stayed at was just a five minute walk from the cable car to N Seoul Tower so my friend and I (our other friends had already left to go back to New York and my teacher friend stayed in Jeonju) decided to visit the landmark. 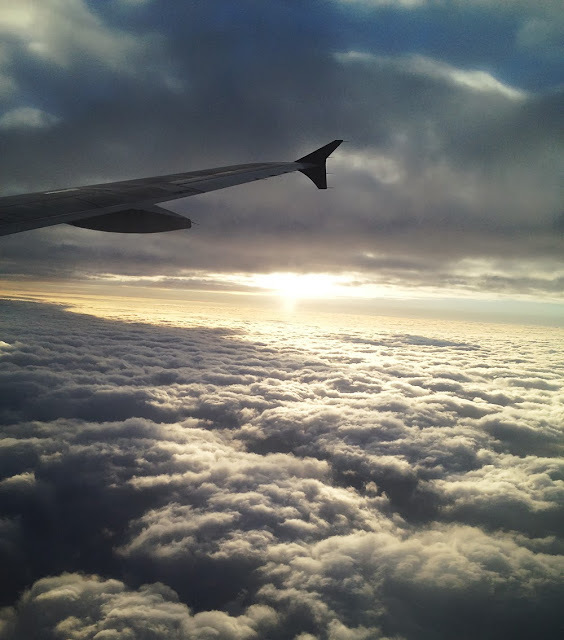 We went right at sunset and it was beautiful. 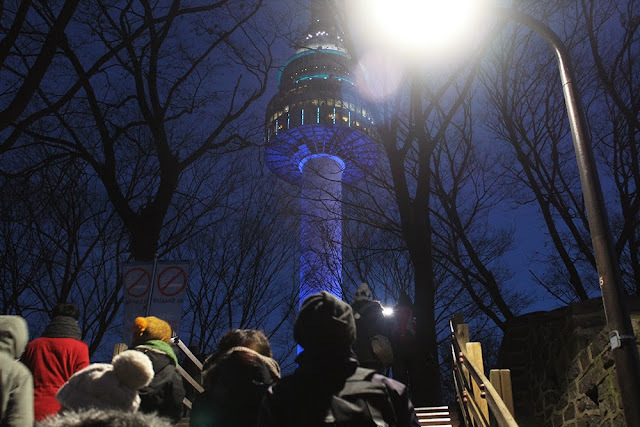 The cable costed ₩8500 round trip which lets you explore the base of the tower. It costs additional to go up the tower but I didn't feel the need to do that. The views from the base of the tower is already quite nice and there are some shops to look at. There are fences where couples place locks and write their names. 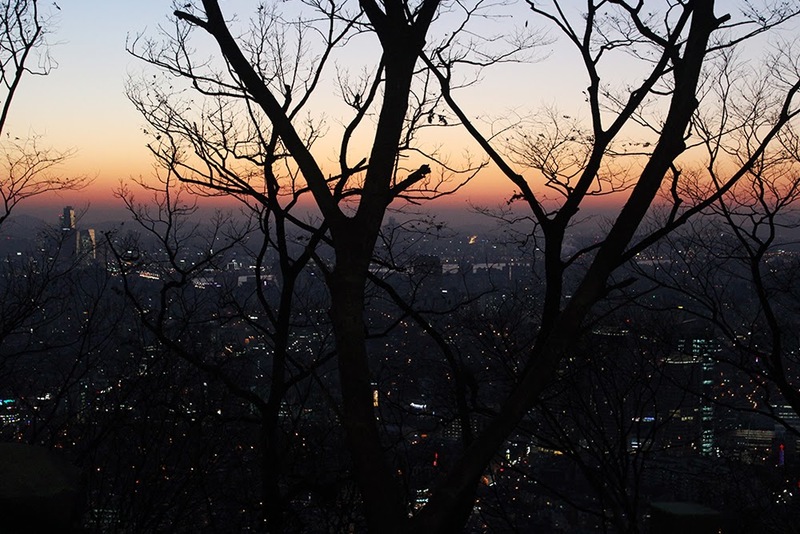 You can get a really great look at Seoul from Namsan Mountain where the tower is located. The city is so much larger than I expected and it's truly a modern, 24/7 hub of endless possibilities. For dinner we decided to eat at the overpriced Korean BBQ restaurant at the bottom of the mountain where the cable car lets out. 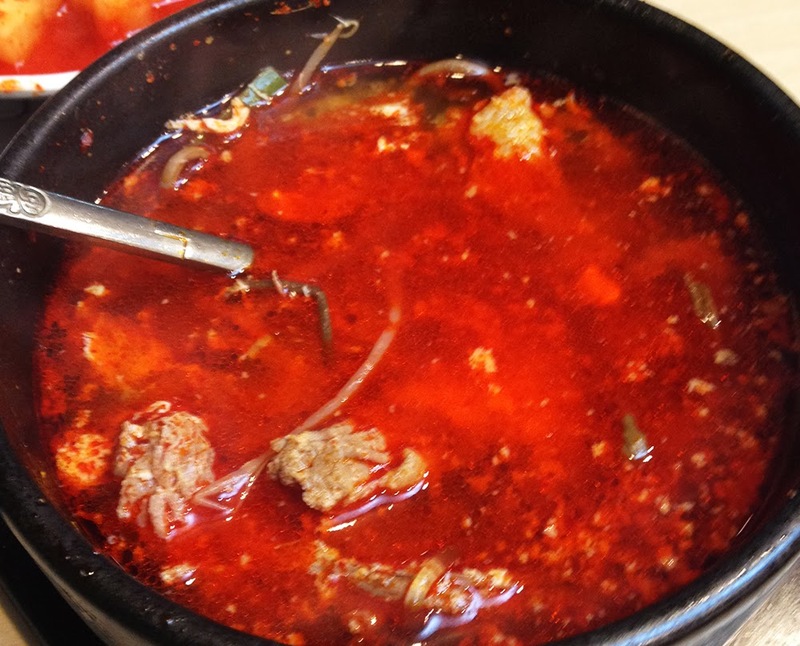 I had a bowl of piping hot beef stew which was yummy but incredibly spicy! I don't think I've ever eaten such a red bowl of soup! We returned to Edae to do clothes shopping because I liked their styles and prices the best. 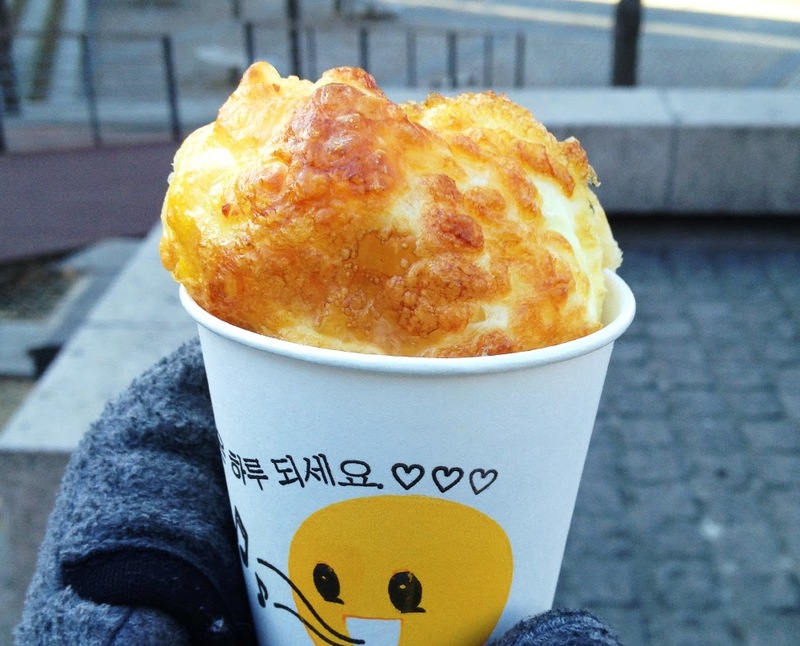 I also really wanted to try egg bread, a streetfood comprised of sweet, crumbly bread topped with fried egg and bubbly cheese. SO yummy! 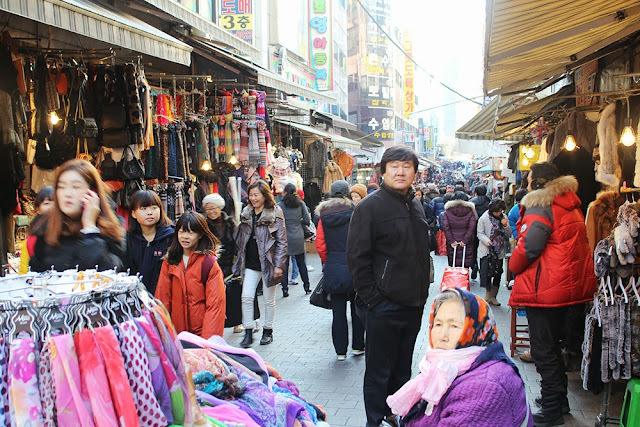 On another day, we tried finding some cheap clothing at Namdaemun, a popular wholesale market. But I don't think the styles were suited for my taste so mostly walked around and browsed. From Namdaemun we took the subway to Dongdaemun, another popular shopping district. 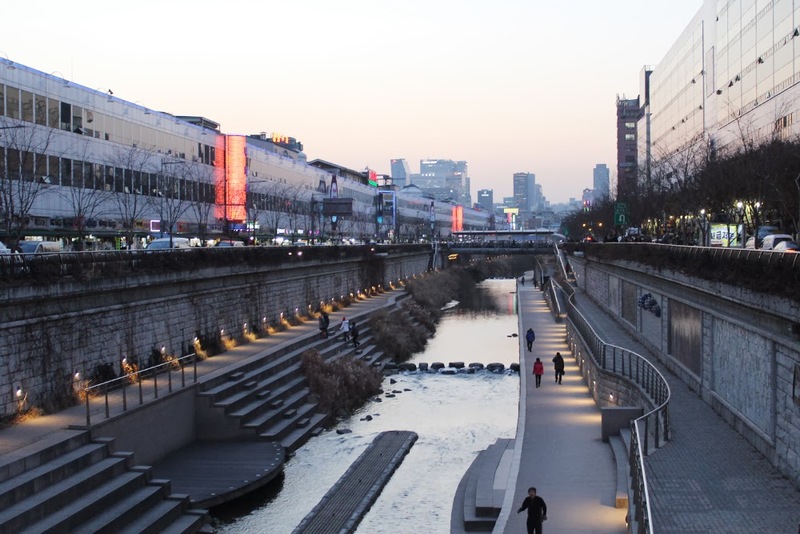 Nearby is the famous Cheonggyecheon Stream which apparently used to be an old dump but underwent an extreme makeover a few years ago. It is now a serene walkway where you can hop over some rocks to get to the other side of the street and stroll aimlessly on a nice day. My friend and I had trouble deciding what to eat for dinner around Dongdaemun because I was admittedly getting a bit tired of noodles and rice. 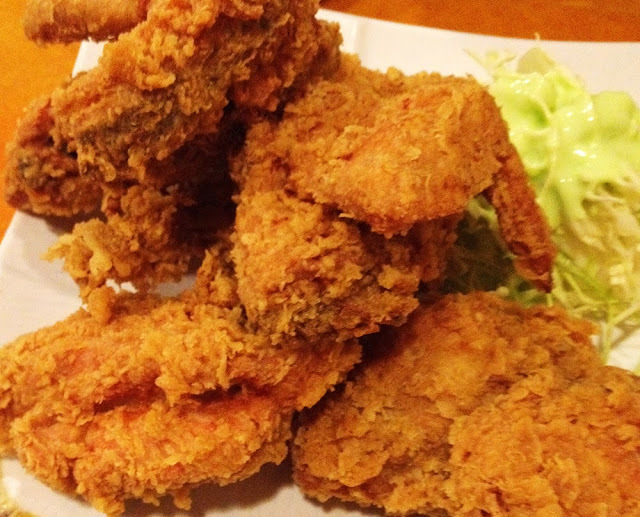 We opted for a fried chicken place that served some of the crispiest chicken I have ever eaten. It's probably not the first thing you think of when someone mentions Korean cuisine, but they can make some seriously good fried chicken in Korea. On our last full day in Seoul, we walked to the Namsangol Hanok Village which took a bit of getting lost and wandering around to find. The Hanok village hosts special events such as taekwondo demonstrations and re-enactments if you come at certain times of the day. 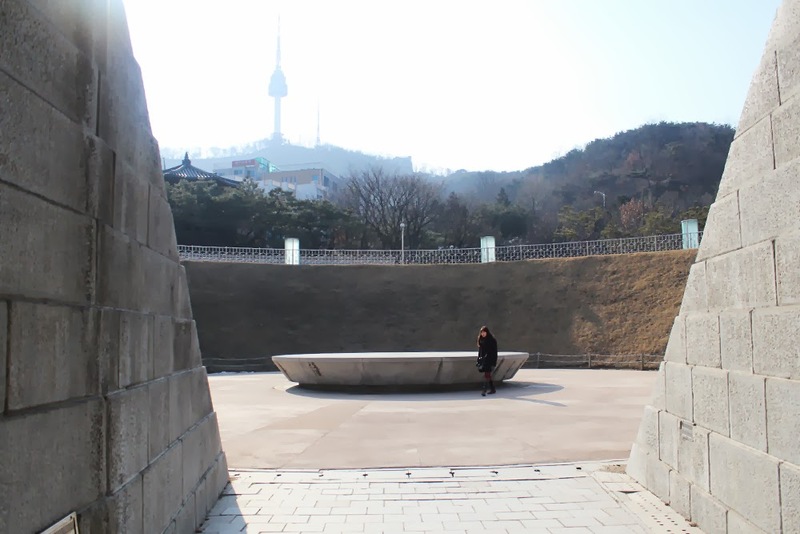 What I found most interesting was the time capsule located at the very back of the Hanok village. The time capsule was buried in 1994 and won't be opened until 2394. And on that note, it's time to conclude my adventures in South Korea. I had a wonderful two weeks with my best friends in a beautiful country that I hope to visit again in the future. Every day of the trip brought something exciting and I highly recommend South Korea to all the foodies, shoppers, and history buffs of the world! 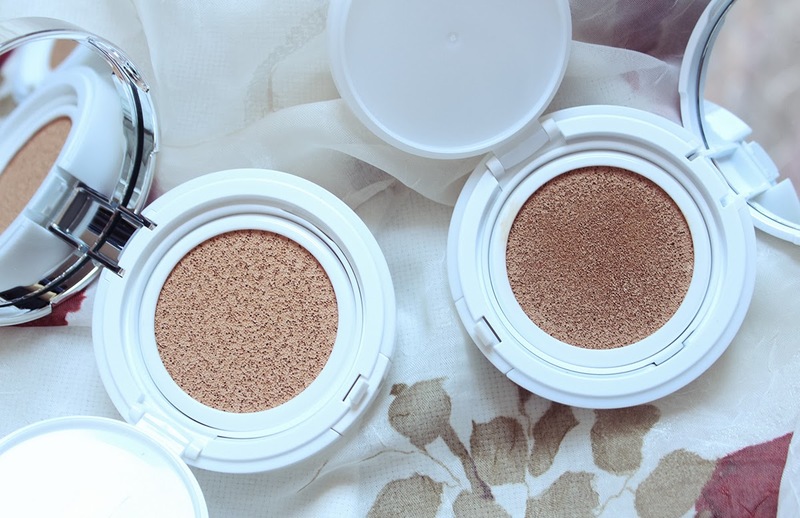 In my next two posts, I'll share what beauty goodies I brought back from Korea so stay tuned!